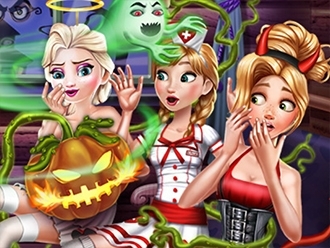 Rapunzel, Anna and Elsa went on a short trip to spend Halloween together, ready to see what they are up to? The cabin needs a little touch up before the spooky night begins so place cool decorations in the room and make sure the girls are wearing their costumes. Everything is set, now let's scare the girls! The ghosts, creepy creatures and evil plants are just waiting for your signal!